I sighed, and started with the knitting of the tiny things again. All last month, tiny thing after tiny thing came off my needles and it was sort of a secret. I didn’t say out loud that it was Myrie’s calendar, but everyone knew. The whole thing culminated last weekend in a flurry of sewing and applique and a general sort of hysteria. I always remember too late that the sewing machine and nine oceans worth of felt is a bit of a production. 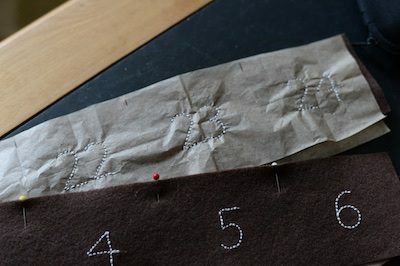 I cut the whole thing out, and I embroidered all of the numbers on the pockets – I’d forgotten you can embroider over tissue paper then rip it away. Way easier. Then, I loaded it into the car, and did something I almost never do. I drove somewhere. Myrie doesn’t live very close to me, but she had to have it for the 1st of December, so off I went, wending my way along the highway, over the big hill to Myrie’s house. When I got there, Myrie’s mum Robyn opened the door and said “I think I know why you’re here!” and I went to the car and got the thing. There is a danger in giving a gift to a three year old, unless you have your head on straight. The three year old could not like it. They could be afraid of it. They could cry and refuse to look at it, or they could promptly flush three tiny things down the toilet because they’ve just learned how the lever works. You cannot care. Gifts to three year old’s need to be freely given, in the spirit of the thing, and without ego. I marched in, hung it on the wall, and waited for NOTHING to happen. I didn’t know when I was making the first one that there would be a second, but I’m clear now that there will be a third. When my grandson is three. I’ve got three years to get it together. (That’s right, a grandson. We’re completely shocked and thrilled, Megan is expecting a boy.) I can’t wait to find out what tiny things he’ll like. SO fantastic. What a treasure for your nephew and niece. Many congratulations regarding your soon to be grandson. Exciting to say the least! This story made me so happy. My now deceased mother made my younger brother a similar advent calendar, and I remember the joy he had in choosing the order. Thank you for invoking this memory, even if it did make me cry! She did specify that the first was for “Lou’s family,” although at the time I am pretty sure it was Lou specific! Next summer when you do not want a big woolly thing in your lap as you knit, make a few tiny things and the next summer again, then it won’t be so crazy when he’s three and it’s time to finish it. Maybe just the sewing will be left. Remember EZ in Knitter’s Almanac? She did Christmas ornaments in the summer for just that reason. In a canoe while camping, no less. Me, I buy chocolate advent calendars from Trader Joe’s for the grandsons. Maybe some year I’ll get it together and knit one. It’s so pretty! The ornaments are darling and you did a great job on the embroidery and sewing up. That’s where I would hit a snag. Wonderful holiday memories for all involved. Thanks for the inspiration and good luck on your next one – maybe you should start it in January. A grandson – such fun! I love your posts so much!!! Congratulations on your grandson. I have a friend who I will be baby knitting for in the New Year and I can’t wait to see what you do! This is just crazy splendid. 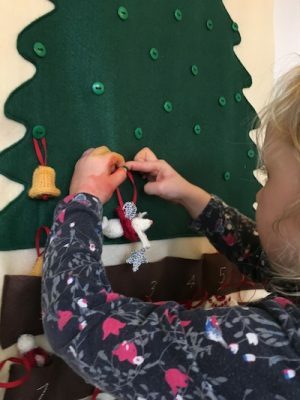 I love Advent and Advent calendars and I especially love the ones you have made. I don’t even have to imagine doing it myself to enjoy yours. And yes, one PER FAMILY is definitely a rule to be clear on. You are just the best. Thank you for sharing your life with us. What a lovey tradition. I like the pompom on the mouse’s hat. Great details that puts a smile on everyone. You always amaze me. Congrats almost grandma. Wonderful! It’s so great she loved it so much. She looks very serious in the picture, too. And congratulations on the littlboy coming your way! My formerly little boy is 18 and quite big and still loves his mother – boys are blessings. did it feel as odd to say “my grandson” as it did to hear it? lucky lucky kid, you’re going to be a wonderful grandmother/grandma/nanna/oma/whatever you decide to go by. please tell Megan congrats, again, from “the blog”. Wonderful post and how lovely to have a new baby boy in the family. Congratulations and good wishes to all. I love traditions, and this one is so sweet! and congratulations on the grandson! Any chance you might start making tiny things *now*, so you can do one a month and be done well ahead of time without driving yourself crazy? I just wanted to say, “I love you.” That is all. Quality comment. There should be more of these comments in the blogosphere. 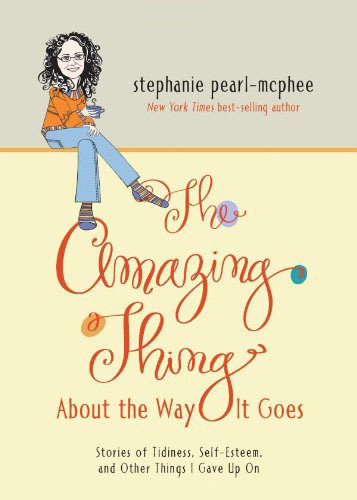 Stephanie, thank you for sharing (large and lovely) bits of your life and family with us. This is a wonderful story, and I love the little lesson on giving gifts to three-year-olds. Very a propos for this time of year. So glad Myrie was able to love it and give you that well-deserved satisfaction for your labour of love. As soon as you said “grandson,” I instantly had a mid-life crisis. Am I old enough for Yarn Harlot to have a grandson?! Lol! Exactly! In our perfect yarniverse, we do not age but children, grandchildren etc continue to in order to achieve those mileposts we have already carved our initials on. That’s what helps keep us young. It is an amazing gift to welcome a son into a family of daughters. Similar delight for a daughter coming into a traditionally male dominated family. So happy and excited for all of you and for all that is to come. I love following along as you share the rhythms and practices of your family’s traditions and must say I still miss your post about the annual Boxing Day visit to your sweet great aunt and uncle, who I believe are now gone? However, I am sure you continue to honour their memory in your own way. Happy Advent to you and yours. Boys and Grandma’s are super special!! Congrats! How abso-tively stunning. I’m so glad Myrie appreciated it. And all hail tissue paper for embroidery. Angel food cake for Jesus’s birthday was like that for us. We always had birthday cake for Jesus, but one year my husband was eating fat-free, so we made Angel food. My daughter was 6, and she thought that was the most logical, perfect choice for a day when Angels are reported to have sung. She instantly declared it a family tradition of the most import! Angel food cake was always Baby Jesus’ birthday cake in my home. Mom told me, years later, that she thought it was a good break from all the rich food of the season. Congratulations!! Blessings and best wishes! I bet Joe is already enrolling him in swimming lessons and sailing lessons. After all Grandpa needs a first mate! I’m bursting with joy and love and wonder at what you’ve created and at Myrie’s delight and her mum’s and I so want to make something like that for my own grandchildren. Thank you for the inspiration! And congratulations to Megan on her little boy on the way! And Meg’s going to have a boy! Double-yay!! Start his gansey now so it might be done by the time he’s 18! That’s so cute! Good job! And congratulations with finding out that your grandchild is a boy! I am so waiting to see what kind of woolies you’ll be making him. Exciting! Congratulations! I have a 1 yr old grandson and being his Nana is the best thing in the world. I guess I should start planning a calender for him. You are such an inspiration. Not sure what to say first. Congrats on a grandson being made. I became a first time grandmother to a grandson last December 11. We did not know the gender, and I had been secretly hoping for a boy. I raised two lovely daughters and their dad died of cancer ten years ago. Little Oliver has glimpses of his grandfather and he melts my heart. I seriously could eat him up. He has the best personality. It’s good to know that three is the magic age for a calendar. I’m going to get on it and make Oliver one. I no psychic nor do I believe in it,but something in my gut predicted Meg was going to be carrying a boy. And it wasn’t a pondering thing. The second you announced her pregnancy I was like ” it’s a boy”. You will find it fun. The calendar is beyond gorgeous and I’m very happy for you to be getting a wee grandson. In case I’ve never told you in the over-a-decade that I’ve been a faithful reader (stalker), I think you are wonderful and deserve all the wonderful things in the world. Best of luck to you and yours. Enjoy all things grandmotherly. A boy! After three girls, it seems appropriate. Congrats to you and Megan. I love your handmade Advent calendars. If only there was something equivalent for Jews! I agree! 8 Crazy Nights are great, but a Maccabee Mouse doesn’t sound quite right! I’ve seen felt menorahs with little knitted/crocheted candle flames that little ones can snap or button to the menorah each night. They look cute. Not only is three the age for it in your house, but I’ve gotten it so engrained in my mind that I’m planning an advent calendar for my tiny one for when she’s three. I have to learn to sew. I have two years. Am I allowed to recommend Craftsy (the website). Good beginner’s sewing classes there. Oh Steph it’s absolutely fabulous. Well done. Thanks for showing us. My niece has just had a baby boy 22nd November he’s a darling. Congratulations to you. You have to wait a while though so I do feel for you but the time will pass quickly especially with the knitting. Good job! Plus so happy it was met enthusiastically! I loved this idea the first time around and was amazed that there was a 2nd go-round! Looking forward to #3! Adorable calendar with all those “wee things”. Congratulations on the grandson-to-be! I can hear those needles clicking now. I have four grandboys, ages 5, 4, 2 and 2 (they’re 6 days apart), and a 14yo grandgirl. The odds that they’ll get fantastic Advent calendars like you’ve made are so low as to be below sea level. Knitting that many tiny things would be overwhelming. My tradition is to give each family member an ornament each year. 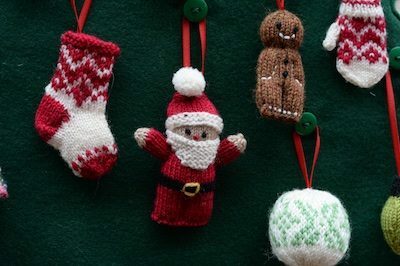 Until now, they’ve all been “boughten,” but knitted ornaments just may turn up in their stockings next year. If so, I’ll thank/blame you, Stephanie! A boy–congrats to the new parents and grandparents! Knitting all these tiny things must have been a pain, but the result is so well worth it! The calendar is simply beautiful! On my mother’s side my Grandmother was one of two girls, my mother was one of two girls, I have one sister and we both had all girls. Now I have a granddaughter ,and wait for it – a grandson! He is such fun there are toy trucks all over the house. Luckily his sister is super cute so there is no problem with favoritism. PS the Advent calendar is a treasure for boys and girls. I love your gift giving philosophy for 3 year olds! Perfection! And it makes it that much more special when they respond the way Myrie did! I just have to share that whenever I have made an Advent calendar, I’ve only started in January. 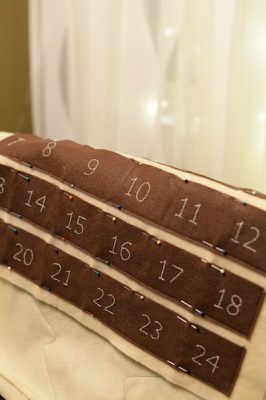 Everyone says to me “Why are you making an Advent calendar in January?” and my response is that it will still not be finished without a flurry in November. I’m slow, what can I say! First of all, Yay for a grandson (I have two, and it is great). Second, Yay for a beautiful advent calendar, and its warm reception. Third, I love that you take us along on your trips down rabbit holes. Fourth, it is true about traditions. My mom warned me to be very very careful what I did around holidays and birthdays, yet I still ended up with the tradition of the castle cake for the 10th birthday. Myryie’s Advent Calendar is adorable. Congratulations to Megan and Alex on their news of an upcoming new grandson for you and Joe. It will be a happy Christmas in your house. I’m sure she’ll love it forever. Such a beautiful tradition. If you start in the new year you could do less than one tiny thing a month and have it ready for his third Christmas! Wow, the calendar looks fantastic! Is there a story to the olive? Love the calendar. Did I miss the link for the Santa? There was a Santa on last year’s calendar. 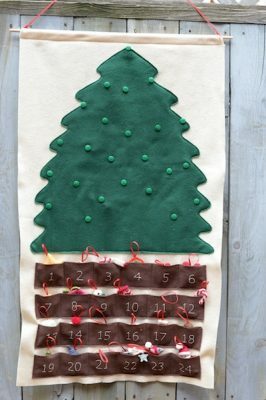 Suggestion for a different order of things: do the tree and pockets first, leave the knitting til you get to know the little fellow. Congrats to all on the coming little boy! Oh my gosh. Did you find a pattern/kit for this, or did you just create it all out of your own head? My son and daughter-in-law made me a grandmother 5 days ago. I’m not sure whether to thank you or not, but my grandson may need one of these in 3 years. You! are dedicated! All those itty bitty works of love! The advent calendar is lovely, an heirloom and all the work you put into will surely be appreciated more and more as the years go by. And Congratulations to Meg and her husband and yourself, Joe and the girls. You will be grandparents, they will be aunties and the cycle goes on. Isn’t it nice that you can only love more? If you are going to start a tradition inadvertently, this was a wonderful one to start! Thank you for sharing the love with us! I just love the calendar. Congratulations on finishing it and Myrie’s reaction. Just think of all the cute boy things you can make! Very sweet story. You win the prize for the best auntie! Congratulations – both on the advent calendar and the grandson. Best auntie and soon to be best grandma! I love how you say that you have to have your head on straight when giving gifts to three year olds…..in my life, you have to have your head on straight when giving gifts to anyone! You just know that really what you were giving was love, and that everyone accepts and rejoices in that part. How nice! Good times ahead! Hearty congrats. Aww! I knew it was for Myrie! Congratulations on the pending grandson! Love the Advent calendar. Our tradition is to make Advent candles out of construction paper, and pin a new flame on every week. Last year my daughter declared Baby Jesus needed a birthday cake complete with candles, when we asked her what kind she replied “Nana’s green(pistachio) cake of course!” This year we will do the same. All the blessings to you on your grandson to be! I would knit something for him but with you as a grandma I think that would be a bit of carrying coals to Newcastle, yes? 🙂 I cannot be the only member of “the blog” with a similar impulse, so I suggest that we who do knit something small and lovely for our local maternity hospital, women’s shelter, or similar in his name. That is a wonderful, gracious and giving suggestion! Thank you! Wonderful calendar and wonderful news – congratulations to all!! The calendar is fabulous. You’re a star! Also, thanks for the reminder on gifting to kids. I’m about to complete my 6-year-old daughter’s “Mrs. Claus” skirt that she just “has” to wear to Christmas carols tonight. Chances are she’ll be disappointed and won’t wear it for months. Perspective is a fine friend, indeed. I’m so glad she showed her love for it right away! It’s so special when that happens (says the mother of a three-year-old…). I had to laugh at myself, reading the posts about the little knitted things and wondering why you needed 24 ornaments for the calendar. In my mind, somehow, you only needed 12, and I was convinced you were making 2 calendars. I only just realized my math mistake. looks like a win with Myrie. at least by age 3 most kids have learned not to eat everything they touch. congrats to all for the baby boy to cuddle in your future. boys are excellent. Congratulations on your grandson! My experience is that either kind of grandchild is magic. The Advent Calendar is glorious and the Mouse Fairy is about the cutest ornament I’ve ever seen. My first thought was to try to duplicate it and then I came to my senses. So happy for you. Once a three yo cuddles something, you know all will be well. Off topic. Toronto FC, football/soccer team will be playing Seattle on Dec. 10th in the final. Don’t miss it. This Wisconsin woman will be cheering for Toronto. Thank you for sharing this little bit of family life during the holidays. A sweet spot in the day. The Advent Calendar is another work of art. Love. It. And best wishes to all of you on announcement of a grandson on the way! Congratulations on the grandson-to-be! I hope Meg is feeling well and all is going well. You’re making me a bit sad – this is the first time in 20+ years of having kids at home that we haven’t done an advent calendar – I’m down to the last one, who just turned 15 and when asked if he wanted an Advent Calendar done, just shrugged and said, “I dunno.” So I didn’t. We have made a tradition of the Lego and Playmobil ones, since they’re good additions to the collection as well, but I’ve also made a little “box” shelf with heavy paper drawers to stuff with little goodies. But nothing this year. 🙁 Yet…..
I’d go ahead and do it, even if it’s a few days late. Since you have 3 years, you can make it even more special by using the left over yarn from the things you knit your grandson. Finish a sweater – knit an ornament or 2 that the color works for. 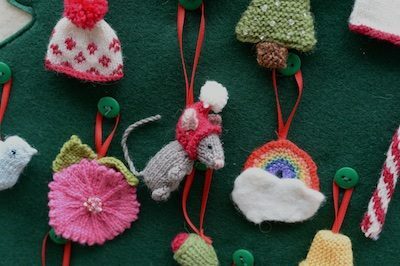 Not put the yarn aside to knit later, but make the ornament then and put the ornament in a special place. Congratulations both on Myrie’s pleasure at the tiny things advent calendar and the news your first grandchild will be a boy! Perfect for Christmas! It is very impressed. I loved this. In the midst of my hard year, this post was a balm. Thank you for sharing your family with us. And congratulations to you and Meg. Boys are wonderful. I love it! You’re going to have to figure out how to knit trucks and tractors and backhoes and all sorts of construction vehicles! What a wonderful, wonderful collection of little knitted everythings. It certainly is a wonderful tradition you created. I’m late to the congratulatory party. But congratulation. I’m thrilled for you. I have many pregnant friends and no pregnant children. So auntie it is for me, for now. Good tradition at home. I have a daughter and try to find such tricks for them to improve their creativity.